On Saturday, 21st March 2015, I attended my first UK Gathering, which was organised by Huw of FFB40. I say my ‘first’ because I know it won’t be my last! 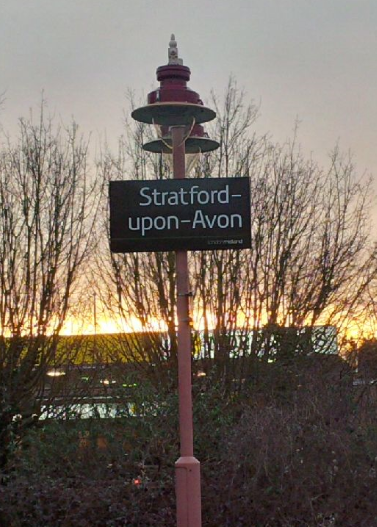 The day nearly started off disastrously for me as I found out almost belatedly that there was a station at Birmingham other than International and New Street – I’d never heard of Moor Street – and that that was where I had to catch my connecting train to Stratford Upon Avon! Cue lots of running but I made it just as the train was pulling into the platform! It was a bright but rather chilly day in Stratford Upon Avon when I arrived and from the little I saw of it, it’s a beautiful town. As is always the case (well, my case!) when meeting people you don’t know, it can be a little bit awkward but I found myself immediately at ease, everyone was really friendly. I did think it was funny that only 3 of us were bloggers (myself, Huw and M from There’s Value) – aside from spouses, the others didn’t appear to have their own blogs but were regular readers and part of the PF/FI community. Our gathering numbered 11 (12 if you include M’s little one in the pushchair!). The “most impressive journey award” went to Richard and Alison who drove all the way down from North Yorkshire! What did I get out of the Gathering? It was great to finally put faces to names and to meet new people. I found it liberating to be able to talk about money, ask financial questions (without people pulling a face!) and discuss investments with like-minded people. How great was it to talk about retiring early without someone mentioning a big lotto win! I picked up on stuff which I will do further research on and also was able to get some feedback on an idea (which may or may not include monkeys…) that I’ve had that’s been bubbling for a while but which I’m not quite ready to kick off just yet! I really enjoyed hearing first hand what people did or were doing towards achieving FI, people from different backgrounds, different careers and jobs, some with young families, some with only a few years left before they think they can stop working, some on the verge of changing careers. Found it all really fascinating and interesting. The other thing that I got out of this gathering was a bottle of home brew! As agreed, I swapped a bottle of my home brew bitter (still a bit shaken up from my running earlier!) for one of M’s bottles of perry, which I look forward to trying. I left the gathering full of motivation, encouraged that the path that I’m taking is the right one for me. My one complaint of the day? The day went by far too quickly and I was unable to get the chance to talk to everyone properly. Partly my fault I guess, as I’m a bit rubbish at mingling. As I was sitting on the cold platform waiting for my train home, I was quite envious of those who were staying the night as they would be able to continue their conversations and discussions. The general consensus was that the gathering was a real success so it was only natural that there was talk of the next one. York has been suggested (evidently keeping along the theme of places of culture as a meeting place! ), sometime in the summer – I’m sure there will be more info as dates/locations are looked at. It will be great to see everyone again but also hopefully, there will be some new faces too. Anyway, I’m so glad I made the effort to attend the meeting – thanks very much for organising it, Huw! It was great to meet you and everyone else on Saturday. I thoroughly enjoyed myself and so did Alison who was a little sceptical of the event. When we reflected on our day Alison spoke very highly of yourself and took a lot of inspiration from you. So thank you. I know what you mean about feeling awkward with people you don't know. I only really managed to talk with 4 people in any depth and felt a bit guilty as I drove home that I had not made more effort to speak to everyone. It was great to finally meet you in person. Myself and LM had a great day. Hopefully we can catch up in York and spend a bit more time chatting. Superbly summarised! It was a cracking day wasn't it. I didn't realise you felt that way about meeting strangers. It probably didn't help when you offered your hand to say hello and I just gave you a big hug instead! I agree with your point that I felt relaxed very quickly around everyone. It felt like we'd known each other a lot longer than the couple of hours that we were all together. I didn't mention it in my post, but I agree that it was nice to put faces to names. Lou said "won't it feel weird writing for people that you know now". I said it'll feel quite the opposite for me now. It's nice to know the readers a little more, and in turn to get to know you and M as I'm reading your posts. Thanks again for the special label, it's awesome! I'll save the picture you provided too! I too wished the day lasted longer. No sooner had it started, we were saying goodbye to people. I'm suggesting a 2 nighter in York for those that are interested. We will of course welcome people just for the day, but it'll be nice to stretch it out for those of us that are keen to prolong the experience. The 'thing' that may or may not involve monkey's is very exciting. I'll be keeping a close eye on the developments there. Thanks again for coming along. I really appreciate it and I look forward to meeting you again in the summer! It was great meeting you and Alison and I too thoroughly enjoyed myself. I had a lovely chat with Alison and gained a lot of inspiration from her in return – I wish her all the best for her next job! I was very flattered to hear that you regularly check up on my blog (and Huw's! ), thank you very much for your kind words – I really value your support! The day went by far too quickly but next time, I shall attempt to make more of an effort to speak to everyone. I hope to see you and Alison at York! Great to meet you and LM. I hope to be able to chat to you both properly in York! I'm not as bad as I used to be with regards to meeting strangers, although you didn't see me stopping outside Carluccio's and doing a few deep breaths before I walked in haha! I shall keep you up to date with the 'monkey' thing! Looking forward to seeing you and Lou again in the summer! It sounds like a really great day. Hopefully I'll be able to make it next time around. 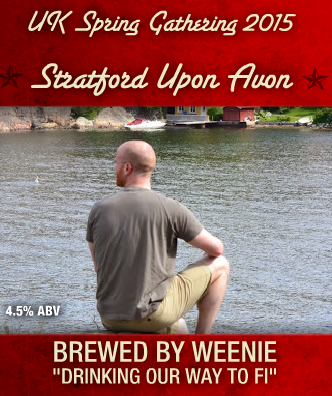 Weenie – Bill here – sorry we didn't get a chance to chat properly. My fault, as I wasn't there for long enough. But the event led to me discovering your lovely blog which was a highlight. Keep up the good work! Hi Bill, I'm sorry too that we didn't get a chance to talk properly, except for me to say "hi", "thanks for the pint" and "bye!". My round next time – hope you can make it and we have a better chance to chat! I really enjoyed it, but sad I couldn't stay longer. I do hope we can all meet up again in York for a 2 dayer and then we can also meet many mroe people like Cerridwen and the Finance Zombie, and TFS and many more. Hi M, was great to finally get to meet you and I would have loved to have chatted longer. Hope to see you again in York and yes, along with the likes of Cerridwen, Finance Zombie and TFS and others. It was a great day – hope you can make the next one! Sounds like a great day had by all! I'll be up for York next time. Lovely city and really want to get involved and meet everyone. It's a long way for us so would definitely be looking to make a long weekend out if it! We are fairly free in July and august so I'm really hoping the dates work favourably this time. I know what you mean about getting nervous, I am generally not that bothered about meeting new people but for some reason I can see myself being so for this sort of thing, it's a bit different as although we are strangers we surely have preconceptions of each other through our writings. Yep it was a great day, felt a little weird at first – not used to being able to openly talk about money and investments! Yes, I'm definitely up for York too and look forward to meeting you and Mrs TFS! Been there on many occasions and it's a lovely city with lots to see and lots of culture to take in. Although I was a little nervous before meeting everyone, I don't think it was as bad as certain work situations I've been in. Probably because I knew I was going to enjoy myself haha! Yep, everyone was friendly and it was great to be able to talk about investments and early retirement without people looking at you funny or mentioning winning the lottery! Great to read you had such a great time! Must be awesome to finally put a face to all those names online. I hope I can find the time to organise a gathering in Brussels soon to meet some of the other PF bloggers and readers. If you guys meet up in London next time(s), I'd love to try and join! Hey NMW, yes, it was certainly great to put faces to names. Best of luck in organising a gathering in Brussels, it will be well worth the effort. It's possible that London could be a meeting place, not sure, although Huw did mention about arranging one in the south of England. It would be fabulous if you could make it! First of all, thanks so much for stopping by my blog and leaving several comments. That's great you went to a pf/fi blogger gathering. I've been blogging for almost three years and I have to go to one. I'm hoping to go to the Canadian one this year, whenever it happens, which I think may be in the fall. It's a great way to network, meet new people (even though I am terribly shy and introverted) and chat about personal finance topics we are passionate about. Yes, I was so glad that the gathering was organised and that I attended – I don't think it crossed my mind NOT to attend! I hope you get to go to one organised in Canada, it really is worth going to meet new people and to be able to talk with like-minded individuals about things you are passionate about. I found everyone very friendly and it was a very relaxed and casual atmosphere. Thanks for stopping by and all the best! Sounds like fun, I'm actually surprised that there would be only 3 bloggers and more readers. Interesting! Hi Zee, I know, we all found it surprising! Perhaps there will be more bloggers at the next gathering!